Easy to make and cheap because you can use what’s left in your fridge! 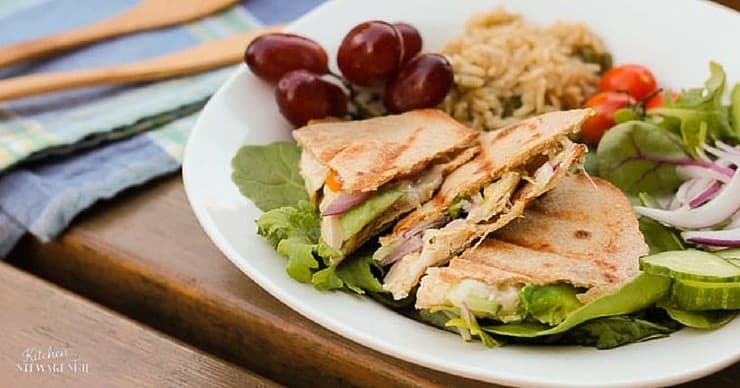 These California chicken wraps will become a family favorite. Homemade hamburger helper is another great option for a frugal family dinner. That’s two easy dinners for your menu this week. Here’s the promised recipe for the second way my family uses avocados (after guac). I learned this wrap at a Pampered Chef party, and we looooove it around here. I always feel like I’m at a good restaurant when I serve them. So easy, so yummy. 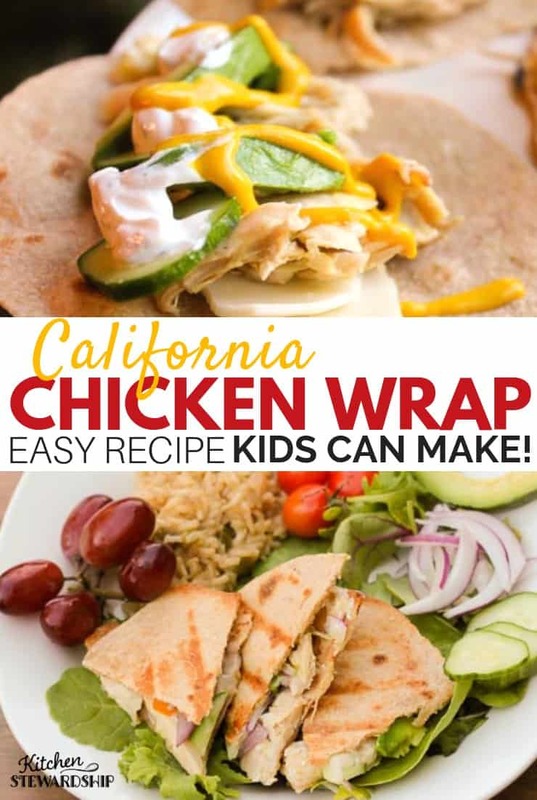 California chicken wraps are both a family favorite to eat…and make! Yes, kids can make them. 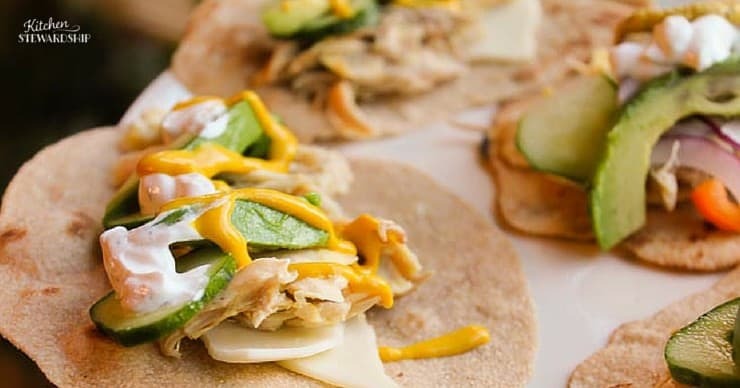 After using the Kids Cook Real Food eCourse your kids will be masters at making homemade tortillas and ranch dressing and at chopping veggies. All the skills you need for this delicious dinner. Stir and let sit while you cut everything else. Cook chicken if necessary and slice vegetables. Salt chicken and add a little Italian seasoning if you have it. Assemble wraps in order given. Roll tightly and grill on a George Foreman or in a very hot pan (dry, no Teflon), seam side down first. Turn once if in pan. Remove when tortillas are lightly browned. Pile onto a homemade tortilla. I like them with mustard! Or…happily toasting on the George. We like it with plain ranch and mustard, because hubby doesn’t like cucumbers. I almost always serve it with a side of Chicken Rice-a-Roni, homemade version. Add bacon or pepperoni and hot pepper for an Italian twist. Chicken is best stir fried or leftover roasted chicken, BUT if you want to use your chicken from making stock, I would recommend sautéing it in olive oil first for flavor. What a super great idea, we almost always have all those ingriednts on hand, including (now) Fresh cucumbers and tomatoes! I make these kinds of wraps all the time, but never thought about grilling them in my GF grill. Thanks for sharing, I’ll be grilling mine next time! What a tasty summer meal. Yum! Thanks so much for stopping by! I have a new recipe to share next week. I’ll try to post on Monday. Happy cooking. I LOVE wraps! This is such a wonderful post. The variations are a treasure. Hope you have a wonderful week! Those sound awesome! Thanks for sharing! Those sound DELISH! I love everything in them!!! Will have to add that to next week’s recipe list! This looks really good. Going to have to try it this week! I’ve never ate avocado’s before. They are kind of expensive around here. I’ll have to try some of your alternatives. Thanks for sharing! Have a great day!! This looks good…and so healthy! Oh now this looks good & I love my George Forman grill to cook on! meghan’s last blog post..Vampires are all the rage, so donate today. These sound amazing! 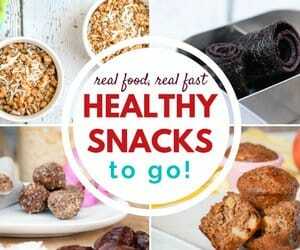 We’ll have to try them soon! Jess’s last blog post..Best Waffles EVAH! We just tried these last night (without avocado’s because we were out!) But it was fantastic!! Thanks for sharing this delicious recipe! 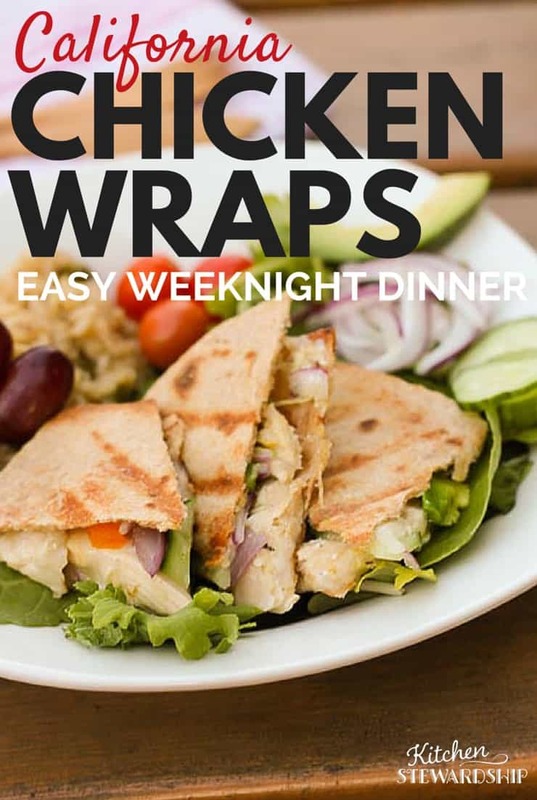 We just tried these wraps tonight and they were SO good! We’ll definitely be trying more of your recipes in the future!! thank you so much for your great website I have just found it. I have been looking for a cast iron grill like GF for ages but all the GF ones I can find are non stick-do you know the type of yours? Sounds really good – now if only I could find a good recipe for homemade Ranch Dressing…. Cukes & toms diced up with some cilantro, diced onion, minced garlic, splash of olive oil & drenched in balsmic vinegar.